The Color Run is back, Port Elizabeth – are you ready for The Happiest 5k on the Planet! The Color Run South Africa is promising less frowning and more clowning at Port Elizabeth’s favourite fun run. The Color Run debuted in South Africa in The Friendly City, and PE has cheered on Color Runners every year since. Now in its fifth year, this year’s theme brings the spirit of the carnival to the streets of PE, as Color Runners celebrate health, happiness, and community in an atmosphere of pure colour and expression. The Color Run is the world’s largest untimed running series. It was founded in 2011, with the mission of bringing people together to make the world a happier, healthier place. Dubbed “The Happiest 5K on the Planet”, The Color Run is less about your 10-minute-mile, and more about having the time of your life. The Color Run has now been experienced by over six million runners, in more than 40 countries around the world. And it’s not just about a day at the carnival – The Color Run cares about community, and this includes a conscious effort to ensure that the region only benefits. 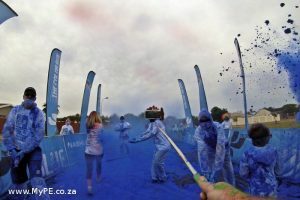 The Color Run has committed to leaving Port Elizabeth cleaner than it found it… and even better, over the past five years, The Color Run has perfected the art of the dry clean up. Every drop counts, and not a drop is wasted. The Color Run also engages with local vendors and employs local labour, ensuring a boon for the area.